Heineken USA has teamed up with menswear brand, Public School to launch the third ‘Heineken 100’ program and celebrate tastemakers and trendsetters. 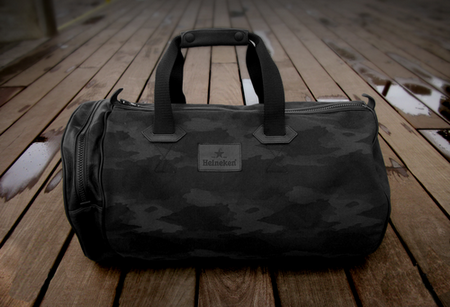 For the collaboration, Public School designed a limited edition camouflage duffle bag made of jacquard twill with leather accents and black nylon straps. The bag was created by Public School designers Dao-Yi Chow and Maxwell Osborne, who also designed limited-edition t-shirts for Heineken’s 2012 Red Star Access program under their streetwear brand, Black Apple. The beer brand has also redesigned its iconic green ‘Star Bottle’ for the U.S. consumers for the first time since 1946. The revamped bottle already retails in select New York State markets and will roll out nationwide beginning March 2013. It will be available in 12 oz. and 22 oz. sizes and features a taller, thinner shape. The bottle is designed to allow consumers hold it at a lower point, keeping the beer colder. The iconography of the bottle remains the same. 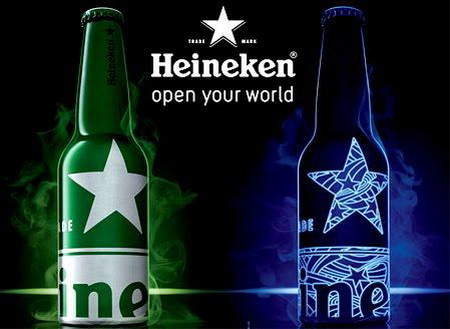 “The newly designed Star Bottle allows Heineken to take a huge step forward in the globalization of the brand, which started with our ‘Open Your World’ marketing campaign and our more recent draught program,” said Colin Westcott-Pitt, VP of Marketing, Heineken USA. Posted in Design and tagged alcohol drinks, beer, bottle design, clothing & footwear, Heineken, Public School, USA. Bookmark the permalink. ABSOLUT TUNE Comes to the U.S.